These Islamic State brides were either participants in these atrocities or otherwise complicit in them in some manner. 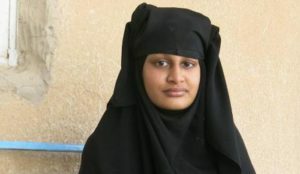 Jihadi brides of the Islamic State are often presented as poor little brainless victims lacking any will of their own, and who were led unwittingly by beastly Islamic State men into chambers of horror, but this is not the case. Shamima Begum and her counterparts are jihadists themselves. They have no remorse, and they raise their children with a murderous hate against infidels. It is stunning that anyone in the UK would take them at their word as they beg for sympathy. Their victims need sympathy. And the Western public needs protection from them. The letter – obtained by ITV News – went on to urge the Begum family to make their daughter aware of the decision while adding she had the right to appeal. It’s not yet known how the ban will affect her newborn son Jerah – who is half British and half Dutch. “We are considering all legal avenues to challenge this decision,” he tweeted. Begum’s dual nationality – as both her parents are of Bangladeshi – reportedly cleared the way for today’s decision. However, Mr Akunjee, told The Independent the 19-year-old is a sole British national and had “never had a Bangladeshi passport”. Earlier, a spokesman said: “In recent days the Home Secretary has clearly stated that his priority is the safety and security of Britain and the people who live here.